The kangaroo is a marsupial ( it means they keep babies in the pouch) from the family Macropodidae (macropods, meaning 'large foot'). In common use the term is used to describe the largest species from this family, especially those of the genus Macropus, red kangaroo, antilopine kangaroo, eastern grey kangaroo and western grey kangaroo. Kangaroos are endemic to Australia. 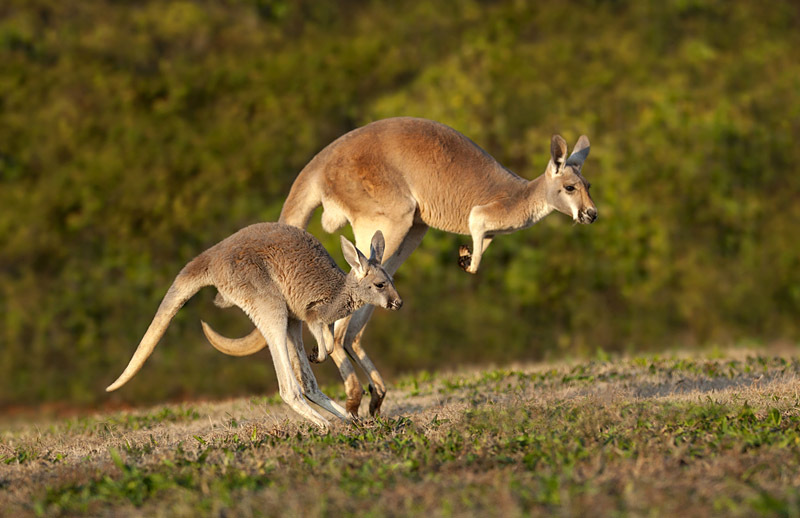 Larger kangaroos have adapted much better than smaller Macropods to land clearing for pastoral agriculture and habitat changes brought to the Australian landscape by humans. Many of the smaller Macropods are rare and endangered species, whilst the larger species of Kangaroos prosper to become relatively plentiful. The kangaroo is an unofficial symbol of Australia and appears as an emblem on the Australian coat of arms and on some of its currency and is used by some of Australia's well known organisations, including Qantas and the Royal Australian Air Force. The kangaroo is important to both Australian culture and the national image, and consequently there are numerous popular culture references. Female kangaroo is usually permanently pregnant, baby kangaroos are born very early, after 1 month pregnancy. Babies will stay in the pouch for about 9 months, before getting out for the first time. Milk composition produced by mother kangaroo depends on how old is the baby. Amazingly, kangaroo can even produce 2 different varieties of milk: one for the newborn baby, and another for the older sibling who still lives in the pouch. 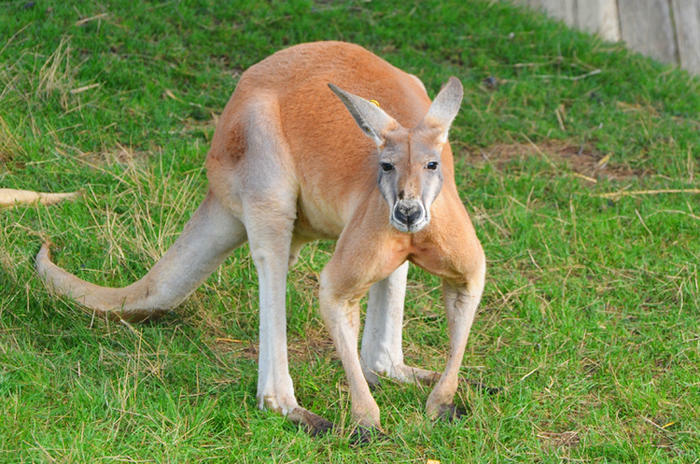 The red kangaroo is the world's largest marsupial. Females have one baby at a time, which at birth is smaller than a cherry. The infant immediately climbs into its mother's pouch and does not emerge for two months. Until they reach about eight months of age, threatened young kangaroos, called joeys, will quickly dive for the safety of mom's pouch. As they grow, joeys' heads and feet can often be seen hanging out of the pouch. 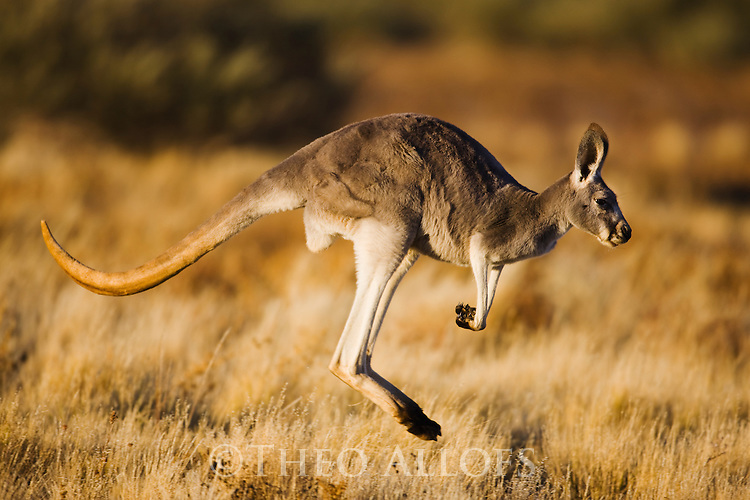 Red kangaroos hop along on their powerful hind legs and do so at great speed. 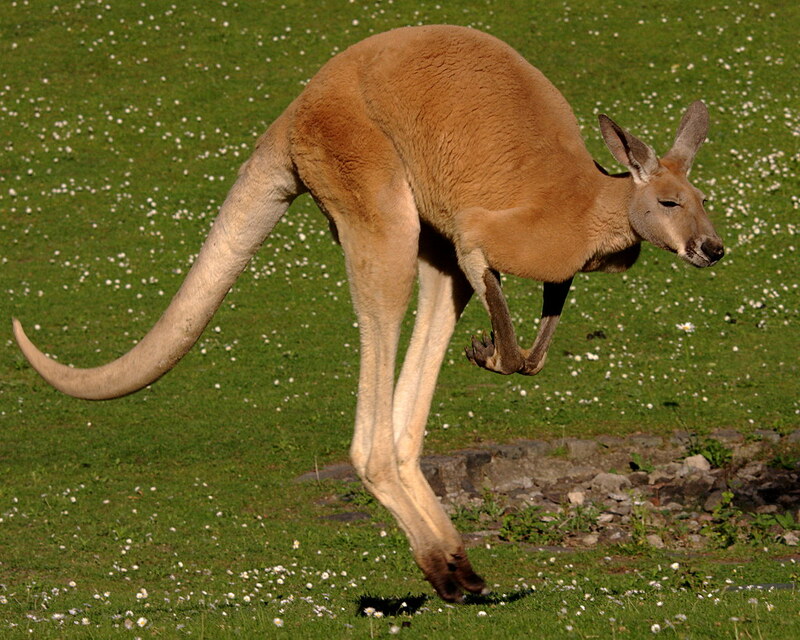 A red kangaroo can reach speeds of over 35 miles (56 kilometers) an hour. Their bounding gait allows them to cover 25 feet (8 meters) in a single leap and to jump 6 feet (1.8 meters) high. Female red kangaroos are smaller, lighter, and faster than males. They also boast a blue-hued coat, so many Australians call them "blue fliers." Larger male kangaroos are powerfully built. 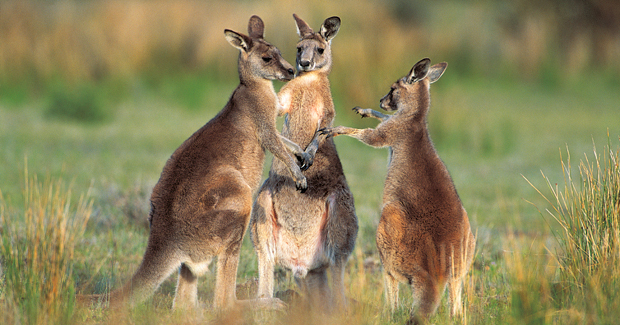 Like many species, male kangaroos sometimes fight over potential mates. They often lean back on their sturdy tail and "box" each other with their strong hind legs. Kangaroos can also bite and wield sharp claws, which they may do in battle with an enemy like a dingo. Red kangaroos live in Australia's deserts and open grasslands, gathering in groups called mobs. Aboriginal and European Australians have spent centuries clearing open tracts of land and establishing water sources—both of which are boons to kangaroo populations. Many millions of these animals roam Australia, and considerable numbers are killed each year for their skins and meat, which is becoming a more popular human food.